The first way is that the buyer can terminate the contract pursuant to Real Estate Transfer Disclosure rescission rights. What is this? The buyer has a 3 day right of rescission or a right to cancel the contract and discharge the parties of their mutual obligations. “If the disclosures in the TDS, or any material amendment thereto, are provided to the buyer after execution of the offer to purchase, the buyer has three days after personal delivery of the TDS (five days if the TDS is delivered by mail) to terminate his or her offer to purchase. However, in circumstances where the disclosures are provided to the buyer prior to preparation of the offer to purchase, the buyer has no right to terminate the offer.” General Information for Buyers and Sellers of Residential Real Property in the City and County of San Francisco, Revised 11/15/12, pg. 28. 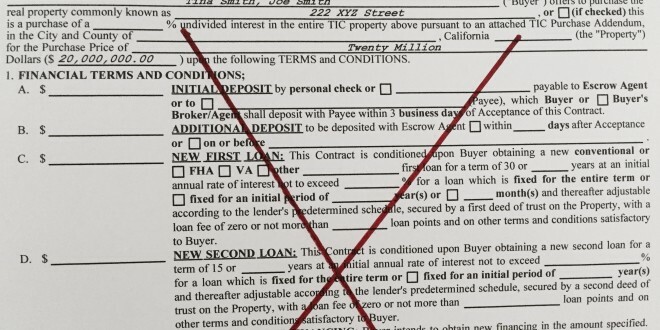 If the buyer falls within the above parameters, he can claim his rescission rights and cancel the contract. The second way the buyer may get out of the obligations of a contract is if he hasn’t made his deposit into escrow. This is a little trickier. The buyer is technically obligated to move forward; however, if he does not move forward, under paragraph 30 of the contract, the Liquidated Damages paragraph, the seller is limited in damages for breach of contract to the deposit actually paid. If there is no deposit, the seller gets nothing. However, there is a promise of “good faith and fair dealing” when individuals enter into a contract so it is not recommended to “stiff” the seller in this manner but buyers and sellers should be aware of this possibility. In this super heated market where buyers are given little time to evaluate properties and end up making non-contingent offers feeling they will not get the property unless they do, we will likely see some buyers getting cold feet and looking for ways to get out of contract. This blog post is not being offered as legal advice. Before a buyer considers cancelling a “non-contingent” contract, he should consult with a licensed real estate attorney. Previous: Reducing Price in a Hot Market! Next: A Reality Check in SF!